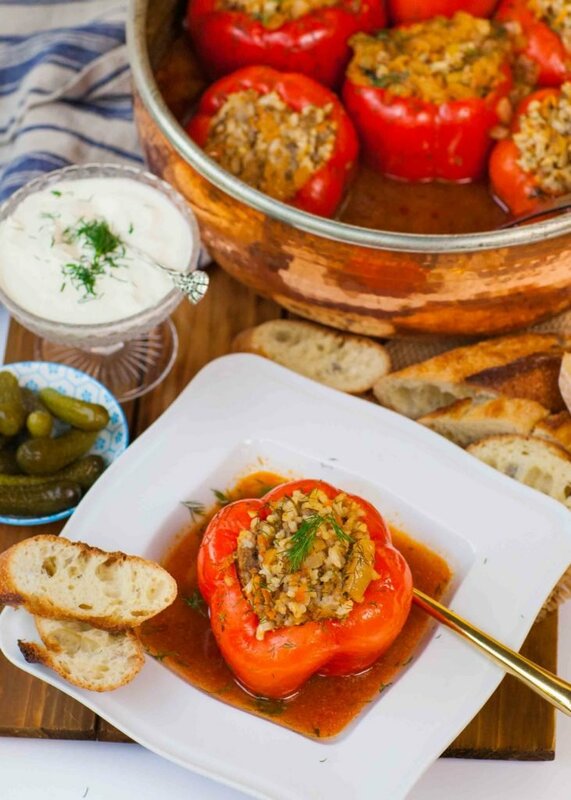 This super easy, Eastern European recipe for stuffed peppers is bound to become a family favorite! It’s made with sweet bell peppers, juicy ground beef, rice, carrots and of course, dill! My Ukrainian family has been making this dish for decades and it never gets old. It’s one of those warming, comfort food recipes that you just keep coming back to, especially during the cold winter months! This dish calls for loads of fresh dill, which is the quintessential Slavic seasoning for any savory dish! For my stuffed peppers recipe, I always use sweet, red bell peppers. I love the sweet flavor of red peppers! You can also use yellow or orange peppers; however, I don’t recommend green peppers – they tend to be a bit bitter. You can even use this recipe with mini bell peppers! Make sure to scoop out all the seeds and the inner white part. The white part contains flavin, which can cause stomach aches and tastes bitter. For the juiciest filling, I recommend using 85% lean ground beef. I love using this higher fat content meat because the fat adds even more flavor. This recipe will work with just about any type of meat – chicken, turkey, pork or even lamb. Whichever meat you chose to go with, the filling will always come out juicy because of the baking method I use to cook these peppers. The addition of the rice in stuffed peppers is also important! You don’t want too little or too much but it’s important to add, otherwise the beef filling would be too heavy. This recipe makes approximately 6 to 7 stuffed peppers. If you’re making this dish for just two, like in my case, just refrigerate the leftovers and reheat in a frying pan the next day! This easy dinner recipe is delicious on its own but I like to add a few extras on the side! There’s a certain way that I always serve these – with a generous dollop of sour cream on top, with a side of small pickles, marinated tomatoes and toasted bread. If you want to experience traditional Eastern European cuisine, enjoy it this way! Looking for more delicious Eastern European recipes just like this one? Try my ‘Stewed Beef & Potatoes’ dish next! It’s one of my personal favorites! I love these ‘Juicy Beef Cutlets’ with mushroom gravy, served over egg noodles! My favorite frying pan ever! This Mauviel 1830 copper frying pan is simply amazing! I love to use these glass mixing bowls for prepping ingredients and mixing. If you want to spoil yourself, this Cu Artigiana copper pan is a beautiful! This cast iron covered braiser is also a great option. Preheat the oven to 375F. Prepare the rice first. Measure out 1 cup of uncooked white rice, then cook it in a small sauce pot according to package instructions. The rice needs to be fully cooked before adding to the filling. Next, prepare the mirepoix for the filling. Melt the 2 tablespoons butter in a large frying pan over medium heat. Add the grated carrots, diced onion and minced garlic. Saute the mixture, not browning, for 6 to 7 minutes, until the onion and carrot is tender. Transfer the mixture into a large mixing bowl. Once the rice is done cooking, add it to the same mixing bowl. Follow with the seasonings, spices and herbs. Allow the rice to cool a bit, then add the egg and ground meat. Using your hands, mix all the filling ingredients together for a few minutes, until a uniform mixture forms. Prepare the peppers: take a sharp paring knife and cut around the top of the pepper, removing the core and seeds. Tap the peppers a few times gently to get rid of any remaining seeds. I also like to remove the white membrane from the sides of the peppers; it can be bitter. Fill the peppers with the prepared filling, compacting the filling into the bottom of the peppers first. Arrange the stuffed peppers in a large cast iron pot, Dutch oven or copper braiser. Next, prepare the braising sauce. Using the same frying pan from earlier, melt the remaining 1 tablespoon butter over medium heat. Add the diced onion and saute for 3 to 4 minutes until translucent. Deglaze the pan with a cup of beef broth, then add the tomato sauce and season the sauce with a generous amount of salt, black pepper and a bit of smoked paprika. Bring the sauce up to a simmer and cook for a few minutes. Add the remaining 3 cups beef broth and bring to a simmer again. 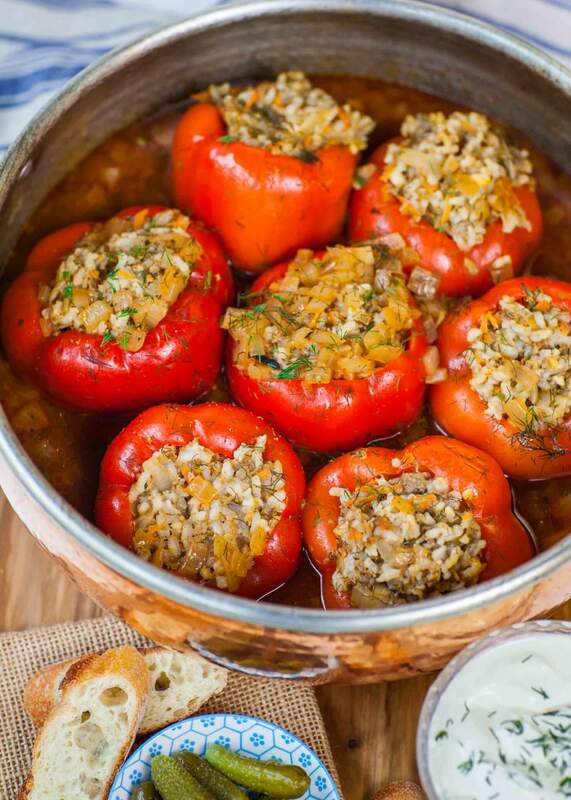 Pour the simmering sauce over the arranged stuffed peppers and sprinkle the top with more dill. The liquids will come up about a 1/3 to 1/2 way up the peppers; there is no need to add additional liquids. Cover the pan with a lid and place into preheated oven. Bake at 375F for 1 hour and 30 to 45 minutes; baking longer will make the peppers softer. Allow the peppers to cool for about 30 minutes before serving; they will be extremely hot when they come out of the oven. Serve the peppers with a generous amount of sour cream on top and with a side of pickles and bread. I just made it today. And it turned out DELICIOUS!!! The peppers were very tender and 1h 30min baking.. This brings me back to my childhood!! Yuuuum!! 😋😋😋 if I were to use mini bell peppers, how long would I bake them for? Very yummy! My family really enjoyed this recipe. Thank you tatyana foryour delicious version. Wonderful recipe, looks so delicious!!!! Also what if I don’t have a dutch oven to place into the oven, is there an alternative for cooking on the stove like time wise or anything? Hi Mellie! Thank you! You can place the peppers in a large pot or a deep casserole dish, too. If the pot doesn’t have an oven safe lid, you can just cover it with foil. Wow, delicious! Made this today & it was perfect. Best version of stuffed bell peppers I’ve ever made… love the shredded carrots addition. I just sprinkled a generous portion of fresh dill on top (rather than mix it into stuffing) with the dallop if sour cream… it really makes a nice presentation! Husband was delighted.